A survey conducted by FAIR of US media coverage of ISIS or ISIS-inspired attacks in Europe and the Middle East reveals a disparity of coverage, showing that European deaths are roughly 1,800 percent more newsworthy than deaths in the Middle East. For the purposes of this survey, both articles and video reports were included. We chose the three most-circulated “traditional media” newspapers and Buzzfeed, one of the most popular newsites for “Millennials,” to get another perspective. The list was compiled using a combination of the Nexis news database and Google. 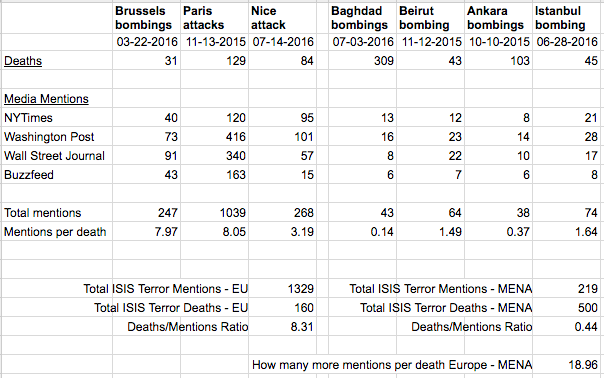 Building on a survey of media mentions from March (AlterNet, 3/31/16) of mass attacks on civilians that are either connected to or perceived to be connected to ISIS (note: The Nice attack has yet to be confirmed as an ISIS-inspired attack), one finds that a death in Europe, broadly speaking, is seen as 19 times more newsworthy as one in the Middle East. Setting aside Baghdad, which one could categorize as a “war zone” (unlike Turkey or Lebanon), deaths in non-Western attacks are nine times less likely to garner news coverage. But why? American pundits like Max Fisher (Vox, 11/16/15) and Brian J. Phillips (Washington Post, 11/16/15) have dismissed those concerned over this discrepancy as “tragedy hipsters,” a pejorative used to describe people who feign outrage over imbalanced coverage. Those like Fisher who dismiss such concerns largely chalk up the difference in coverage to a gap in reader interest, which Fisher supports with a personal anecdote. This argument ignores the extent to which audience interest is shaped by media priorities. Phillips blames the “man bites dog” factor—meaning the attacks in France have more news value by virtue of the fact that attacks there are “more unusual.” While this could be said for Baghdad (and to a lesser extent Turkey), there have actually been three times as many terror attacks in France as there has been in Lebanon over the past year and a half, yet France merited over five times the coverage. Not surprisingly, Fisher’s former publication Vox had only one passing mention of the Baghdad attacks, while dedicating nine articles to the Nice attack, despite it having one-third as many victims. As another point of reference, Vox dedicated three times as many articles to the Taylor Swift-Kanye West controversy as it did the worst terror attack in Iraq’s post-invasion history. Recent reports by Public Radio International (7/16/16) and the New York Times (7/5/16) attempted to answer why, despite being the worst terrorist attack since the US-led invasion in 2003, media coverage of the ISIS Baghdad bombings earlier this month that left over 300 dead was largely absent but came up short, alluding toward the obvious but not really noting it with certainty. Occam’s razor suggests that institutional white supremacy (often manifesting with orientalist assumptions about a “cycle of violence” in the Middle East) heavily influences the disparity of coverage. France isn’t any more the United States than Turkey or Lebanon are, but France and the US do share a majority white population. Without at least recognizing this factor, how can newsmakers accurately assess their editorial priorities? Doing so doesn’t make one a hipster, it means one acknowledges reality — a trait that should be encouraged rather than glibly mocked. Adam Johnson is a contributing analyst for FAIR.org. Follow him on Twitter at @AdamJohnsonNYC. Reprinted with permission from FAIR. Photo: outside the French embassy in Warsaw after the November 2015 terrorist attack in Paris. There is a huge exception to the rule of American media disinterest in Mideast terror deaths–Israeli terror deaths.